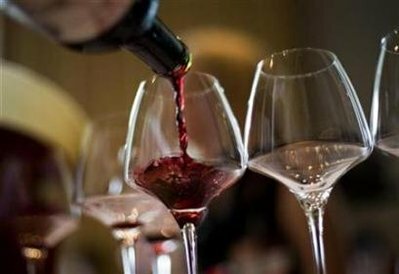 WASHINGTON (Reuters) – A natural antioxidant commonly found in red wine and fruit may protect against radiation exposure, U.S. researchers reported on Tuesday. But, hey, if I had only one hour left til The Bomb Hits I’d dig out that bottle of Chateau Margaux we’ve got tucked away and take it and Kelley to bed. There are worse ways to go. Of course, I’d rather there was time for the bottle to mature (I think it has another 8 years to go before it’s perfect) and then I’d like to have time to talk about it afterwards, and to wait for the next year’s batch and see how that compares, and… Well, huh, I don’t want the world to end. But if it was going to, how would you choose to party? If it were today, as in my kids still lived with me, I would gather up yummy munchies and put a movie on and talk and laugh with them, telling them stories of myself and hearing stories from them. If they were grown and moved on, I would snag up my sweetie, a bottle of Petron, and go to bed. I really don’t know how I’d party on the eve of nuclear war. But Nicola, have you by chance ever seen a movie called “Last Night,” by the Canadian writer/director/actor Don McKellar? (Jeez, I just looked at IMDB, and that movie is now ten years old.) The premise is that the world is going to end (for reasons and causes left unexplained) at midnight, and everyone knows it; it follows several people in their last few hours. It’s small-scale and intimate, gritty, and interesting… I should watch it again. But I found it very intriguing and moving. Sandra Oh’s in it, and that’s always a plus. I would do nothing exceptional. Those I love know it. I would hope to be going about my day,outdoors, raking, throwing the ball to my dog,petting the patio cats,or sitting with my face to the sky and absorbing EVERY drop of life around me. And when I see the flash I would thank God for my blessings and pray that those who survive would learn from the lesson and build a new world without the need for weapons. jennifer, what’s Petron?promiscuous, no, I haven’t seen that one. I’ll go take a look. Thank you.linda, this country doesn’t have a very good record of learning from its mistakes (see the money/banking crisis, see politics, see global warming, see–well, just about everything at the moment). But perhaps others will. I tried to watch “Last Night” once, but I don’t think I watched the whole thing.A old film that I liked better with a similar theme is “On the Beach” with Gregory Peck and Ava Gardner. Ever see that one anyone? I saw “On the Beach” a year or so ago — I don’t remember what prompted me to get to it finally, though it may have been as simple as finding the DVD in at the library. I confess, it didn’t do much for me; the 1950s style got in the way.How about “The Day After”? I need to watch that one again. I remember it freaked out our rulers. My short answer is, “I’d like to be alone.” My long answer is < HREF="http://shetranslates.com/2008/my-last-hour/" REL="nofollow">very long<>. jennifer, yep, I enjoyed that one. Book’s good, too.promiscuous, I saw that, gave me a shiver–but handsdown the most appalling film I ever saw was The Wargame, a BBC docudrama that convinced me, to the point of taking senseless risks, that we were all going to die very, very soon.karina, I associate being alone with being at peace. Which is what I’d feel drowsing next to Kelley in bed with a skinful of delicious wine in me. I’m at home and at peace with myself, but when I’m inside Kelley’s scent cloak, when I’m right up against her skin, I’m doubly at home and at peace.I read your blog post. Jennifer is right. In my opinion you’re exhausted, and feeling the anticlimax of having created something amazing. Kiss Esmeralda awake, then eat something delicious and get some sleep. We’re all here. The world is safe. Life is good. I ironically went to visit my 82 year old mother this day and both of my sisters were there. My brother was not.Nicola’s question rattled in my brain the whole trip over to the house in which I grew up in a very,very chaotic family. There was never an “alone place” in my home. Not from my siblings nor my parent’s war with each other. The Prince of Tides has always resonated with me and, like a line from that film, I can identify with “…the only prisoners they took were their children.” So Karina, you are right about a need for solitude and I admit the personal brokeness harboring in some recess of my being. It most certainly is a tool for survival.Given that said, I do love my parents,my sisters and brother, and always will.I posed Nicola’s question to my sisters. They were appalled at my answer saying “I would want to make sure that I told everyone that I loved them or something that I may have always forgotten to tell them about them.” I asked what was preventing that now and got “the look.”My only addendum to my first post is that I WOULD call my daughters, tell them not to be afraid, and that we will see one another again. (I know that they would already be with each other and worrying about me)And THEN I would go outside and play with the dog who would be oblivious that his life would ever be anything but chasing the ball and digging holes in the dirt.I have said this before. In my job I have learned that no one gets a pass on the bad stuff in life. Every day IS your last day so when you DO awake in the morning with the one(s) you love lying next to you, or a phone call away, give thanks to whatever you believe in that ebbs and flows the universe.And Nicola, I personally have to believe that people are capable of learning and initiating change. If not, then I would hope that the earth, like Yaxha’, would be swallowed whole and covered by a jungle. Karina, I am going to print out your long response and read it before bed…in the solitude of my room. :) Take care. I think the key to the end is, as you say, to live it as you live your life; to just be. The point of life is to live it.Tomorrow I’m posting my recipe for a life of delight. <>nicola, Linda, jennifer,<> thanks for the hugs. I had a good walk yesterday. I missed long walks. I think I’ll go the two-and-a-half hours on foot to UBC today, too. nicola, the weather is shaping quite nicely for your birthday.I’ve had < HREF="http://www.joyland.ca/stories/vancouver/the_sound_morning_glory" REL="nofollow">the suspicion<> for a long time that it’d be the junkies or the sick who’d survive the apocalypse. A few weeks ago, I was delighted to find a cool book on it: < HREF="http://www.amazon.com/gp/product/B0013L2E2M?ie=UTF8&tag=teapot-20&linkCode=as2&camp=1789&creative=9325&creativeASIN=B0013L2E2M" REL="nofollow">Survival of the Sickest: A Medical Maverick Discovers Why We Need Disease<>. It talks about how people with hemochromatosis (high iron in the blood) were the ones who survived the bubonic plague, securing a place for their “defect” in the evolution ladder of humankind. There’s curious facts about frogs that become completely frozen—solid, like popsicles—during winter, then in summer defrost and go jumping and croaking about their business. They have a really high level of sugar in their blood, so their cells don’t freeze into the crystals that cause the walls to rupture and result in deadly frostbite. This accounts for northern populations having a higher incidence of diabetes than those living in warmer climates. Same with MS, the further away you move from the equator, the higher the incidence. People who relocate closer to the equator before puberty, acquire the risk of the population they moved into. Perhaps it’s some evolutionary advantage that allows—especially white-skinned people, since Inuit and other northern Native American populations don’t show a high frequency of diabetes or MS due to climate conditions—to better cope with the extended lack of light. This month, the New Scientist has an article that would be a nice addition to the book: < HREF="http://www.newscientist.com/channel/health/hiv/mg19926723.900-did-the-romans-destroy-europes-hiv-resistance.html" REL="nofollow">Did the Romans destroy Europe’s HIV resistance?<> Survival of the sickest indeed. karina, the whole MS/latitude thing is about exposure to sunlight, and diet. That is, the level of vitamin D is one’s blood. (There’s lots o’ D in cold-water fish e.g. salmon oil, cod liver oil, etc. So if you eat the northern native diet, you don’t need as much sunshine.) I should really go live in Colorado up a mountain: sunny, but not hot.Yep, I read the article about Romans and HIV. It’s an interesting hypothesis–though I’d like to see more studies. Provisionally, I think they’re right. Oh, that vitamin-D thing makes sense in a way. But Canada still has the fifth highest rate of MS among countries. And people eat salmon–and fish in general–like crazy. I want to say that the only country that eats more fish than this one is Japan, but I’d just be saying it off the top of my head, as I usually do.It’d be interesting to see if increasing sun exposure after puberty does affect MS. There are no studies about it that I know off. I’ll try to follow your example and wait for more studies before I get too excited about “new” theories.Colorado sounds good. I could live there, too. It’s the lack of sunlight that really gets to me up here, not so much the cold. ah Nicola, my spelling… Patron, not Petron… Patron Silver Tequila, though, perhaps I would go with a delicious wheat beer, since it wouldn’t matter. Going gluten-free, it’s what I miss the most, a great beer. I think we should all get a little drunk, do a few drugs, eat 2kg of bacteria per year, get a little sick often… We’ll have more bases covered when the apocalypse hits.